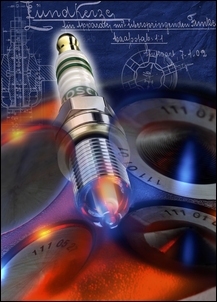 If you’re interested in performance or economy, knowing how to monitor the output of the factory-installed oxygen sensor(s) is vital information. While it sounds like it might be difficult, gaining useful information from these sensors can cost as little as AUD$15 and require only one connection to the sensor. So let’s take a look at the different types of sensors that are most commonly fitted, and see how you can use the information gained from these sensors. All exhaust gas oxygen sensors are designed to monitor the instantaneous air/fuel ratio. As its name suggests, the air/fuel ratio indicates the proportions of air and fuel being mixed to burn in the engine’s combustion chamber. In that mix there is always a lot more air than fuel. An air/fuel ratio of 12:1 (by mass: 12 parts air, 1 part fuel) is called rich and results in better power production from the engine than leaner air/fuel ratios. 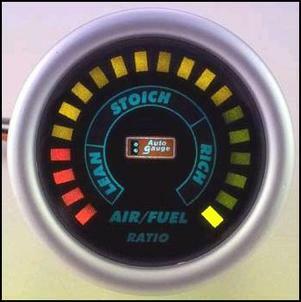 An air/fuel ratio of around 14.7:1 is called stoichiometric; this term indicates that the proportions are chemically correct for best combustion. This air/fuel ratio is used very frequently because, while it is not best for power or economy, the exhaust system’s catalytic converter performs optimally at this air/fuel ratio and therefore harmful exhaust emissions are at their lowest. 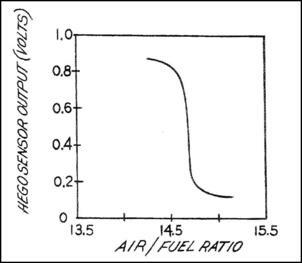 A ‘lean’ air/fuel ratio might be 16:1, while an ultra lean air/fuel ratio might be as high as 20:1. Remember: with air/fuel ratios, the higher the number, the less fuel is being mixed with air. In most cars the air/fuel ratios, as dictated by the car’s Electronic Control Unit (ECU), vary across a range of driving conditions. So the air/fuel ratio will automatically be set rich when maximum power is needed, at stoichiometric when the car is cruising, and lean when the driver lifts the throttle. However, there is a huge range of different behaviours in different cars: some cars have been programmed to stay at 14.7:1 all the time, while others may go richer but never leaner than 14.7:1. Most cars of the last 20 years are fitted with what are called narrow band oxygen sensors. Typically, they take the form of a zirconia device that, in the presence of exhaust gases, generates its own output voltage. If you like, it acts like a little battery. 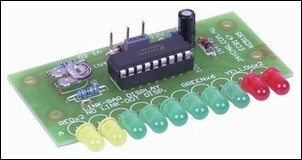 The sensor outputs a voltage of approximately 100 - 900mV, depending on the mixture strength. This diagram shows the output characteristic of a zirconia oxygen sensor. As can be seen, the voltage exhibits a rapid switch around air/fuel ratios of 14.7:1. This is the characteristic curve output of a narrow band oxygen sensor. In addition to the air/fuel ratio, the output voltage of the narrow band sensor is heavily dependent on its temperature. When the sensor is cold it will have little output; when it is too hot the output will also be lower than would be expected. In most cars, the oxygen sensor is used to maintain an air/fuel ratio of about 14.7:1 during idle, light load and cruise conditions. This behaviour is called ‘closed loop’. This diagram shows the closed loop functioning. Because it is a feedback loop, the actual mixtures constantly fluctuate a little above and below stoichiometric. 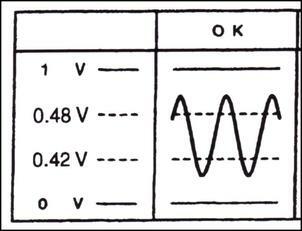 The voltage output of the sensor therefore also fluctuates. Note: a tail-pipe mounted sensor (as used in aftermarket tuning) will not show these little mixture fluctuations – the damping effect of the exhaust pipe (and any internal damping in the meter) causes an average air/fuel ratio to be displayed. The average of all the little ups and downs is stoichiometric – around 14.7:1. 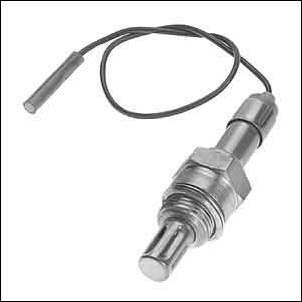 Narrow band oxygen sensors usually have one, three or four wiring connections – in the case of the three and four-wire designs, the extra two connections are to power an internal heater. If the sensor has five wires, or is specifically termed a ‘wide-band’ sensor in the manufacturer’s literature, it is not a narrow band design – we’ll cover wide-band sensors in Part 2 of this series. The easiest way of monitoring the output of a narrow band sensor is with a LED Mixture Meter (see Mixture Display Kit For Fuel Injected Cars). These meters simply display the raw output voltage of the sensor, with the illuminated LED indicating the voltage. Compared with using (say) a multimeter, a LED bargraph display is much more useful as its reaction speed is very high and yet it remains readable. So why is a fast response necessary? As described above, in closed loop running the output of the oxygen sensor will rapidly rise and fall as the ECU tries to keep the air/fuel ratios around 14.7:1. Thus a flickering Mixture Meter display indicates closed loop operation. On the over-run, the ECU will switch off the injectors (ie the Mixture Meter LEDs will all go out, indicating a very lean mixture), while at full throttle the mixtures will be enriched, something that the Mixture Meter display will show by lighting a LED at the ‘high voltage’ end of its display. Many people suggest that a simple LED Mixture Meter is a useless instrument to have in a car – “I bought one and it was just always jumping all over the place” is a common comment. However, I utterly reject this notion: you may as well say that a tacho is useless because the needle rises and falls a lot! A simple LED Mixture Meter will indicate the operation of closed loop, injector shut-off, high load enrichment, health of the oxygen sensor, and the presence of some mechanical and electrical engine management problems – eg the fuel pump getting tired. It will also allow you to drive more economically – more on this in a moment. Many will also suggest that a narrow band sensor and a LED Mixture Meter (or multimeter) is useless for any tuning purposes – again this is not the case. As we showed in Real World Air/Fuel Ratio Tuning, it’s possible to use a narrow band sensor to gain good tuning information. So is using a narrow band sensor as effective and safe as using a wideband sensor and dedicated tuning equipment? – definitely not! However, using the factory narrow band sensor is vastly better than tuning by ear alone. The LED bargraph Mixture Meter is an electronics kit. If you have never built a kit before, have a look at Cheaply Monitoring Air/Fuel Ratios which describes in step-by-step detail how to build it. 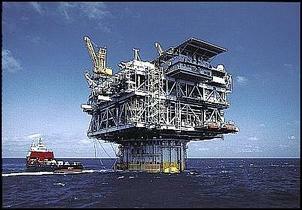 If you’re still doubtful of your ability, any electronics technician could build it for very little cost. If you don’t want to work with a kit, there are commercially available narrow band gauges available – see In-Car Air-Fuel Ratio Gauge Buyers' Guide - Part One. Electrical installation of the Mixture Meter kit is done in the following way. The meter is powered by an ignition-switched 12 volt source, and so you will need to access such a supply at either the fuse box or another switched device (like the radio). Connect positive 12 volts to the '+12V' pin on the meter, and connect the 'GND' pin to earth (the chassis or negative lead of the battery). Make sure that these wires are connected the right way around - the meter is not protected against reverse power supply polarity! The final meter connection is to the signal output of the oxygen sensor. If your car is fitted with a single wire sensor, simply connect the signal lead from the meter to this wire. Don't disconnect the oxygen sensor output from the vehicle ECU; instead wire the meter in parallel. The Mixture Meter does not draw enough current to affect the reading that the ECU is making of the sensor. The easiest way of making the connection is to access the oxygen sensor wiring near to the sensor itself. 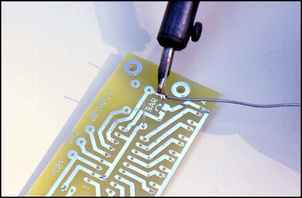 Bare a short length of the wire by using a razor blade to carefully slice away the insulation covering, and then solder or crimp the mixture meter signal lead to it. Wrap the joint with good quality insulation tape or seal the connection with heat-shrink tubing. Alternatively, you can access the oxygen sensor signal wire at the ECU. If your car's sensor has more than one wire, you’ll need to locate the signal output wire. Set the multimeter to read Volts and then connect one lead of the multimeter to the chassis. With the other probe, measure each oxygen sensor wire. With the car running and up to operating temp, one wire will have +12 volts on it, another 0 volts (the earth), and the final wire 0.4-0.6 volts. It is the latter that is the oxygen sensor output, which must be connected to the '02INPUT' on the Mixture Meter. If you cannot locate an oxy sensor wire that has a voltage that fluctuates within the range of 0-1V in different driving conditions, the Mixture Meter cannot be used. Note: you must always use a digital multimeter to measure oxygen sensor signals – never an old fashioned analog meter! The older meter will draw too much current from the circuit, loading-down the reading and potentially damaging the sensor. If you use a high impedance digital multimeter, there will be no problems. With the car running, the connected Mixture Meter should light some of its LEDs. If the oxygen sensor is still cold, the 'lean' red LED may be the only one to light, but as the sensor comes up to temp, other LEDs will also glow. With the sensor up to temperature, a blip on the throttle should cause the lit LED to run up and down the scale. Calibrating the meter is simple. With an assistant installed in the passenger seat and with the engine up to operating temp, drive at a constant speed - say 60 km/h - and with a steady throttle opening. The lit LED should start oscillating up and down the display, as the ECU makes the mixtures alternately rich and lean in closed loop operation. Adjust the trim-pot so that the oscillations in either direction are symmetrical around the middle LED. Now use full throttle and watch what happens to the mixture read-out. The display should instantly show a rich mixture (either of the two yellow LEDs lit), and this mixture should be constantly held. Lift the throttle abruptly and the display should blank, as the injectors reduce their flow on the over-run - and so the mixture goes full lean. At idle, the meter should again show the closed loop oscillations. If your car uses a different operating logic to the one described, some of this Mixture Meter behaviour will also be different. 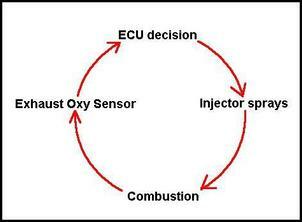 However, you should still be able to see patterns such as injector switch-off on over-run, closed loop operation, etc. Mounting of the display can be done in a variety of ways. The LEDs can be remote mounted, and if desired, can be swapped for square ones. 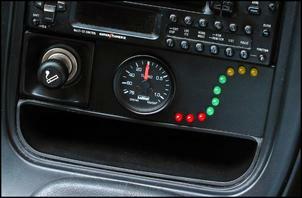 So now that you have Mixture meter LEDs positioned all over the dashboard, how do you use them? The first step is to simply watch the display over a wide variety of driving conditions. From this, you’ll soon learn when the car is in closed loop, when it is in lean cruise (if ever), when the mixtures are enriched, and when the injectors are switched off. The greatest gain in fuel economy will be made in most cars if the fuel enrichment that occurs at high loads is rarely seen. For example, when climbing a hill, you might find that lifting your foot just a fraction causes the ECU to switch back to closed loop from enriched mode. Lifting your foot may make almost no difference to your speed up the hill, but will reduce fuel consumption. Moving to higher gears earlier may be best; in other cars it will be better to rev slightly higher at a reduced throttle angle before changing up. In both cases, the lower the engine revs achieved while still staying in closed loop, the better. In some cars the injector shut-off does not function unless revs are above a certain level. When travelling down a long hill with no throttle being applied, in these cars it can be better to drop down a gear, so lifting no-load revs and triggering the injector shut-off. 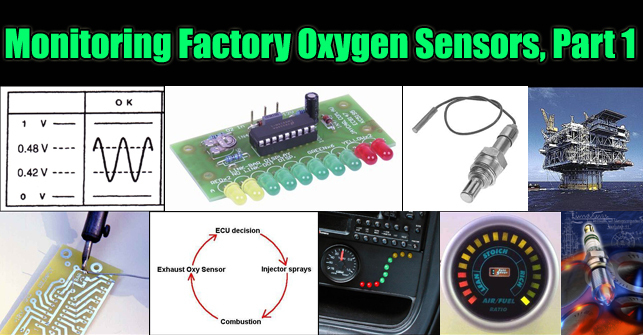 The standard factory narrow band oxygen sensor is a valuable source of driving information. Using just a cheap display, it’s easy to monitor what real-time air/fuel ratios the ECU is using, allowing you to drive more economically and see if problems develop.